Whether you craft birdhouses, t-shirts, or paintings, we all need a space to unleash our creative side. Working on your favorite project in the middle of your kitchen or living room simply won’t cut it anymore–you deserve a space of your own, and we’re here to give you some easy tips to make that happen! Once you’ve found a nice little nook to begin your journey to hobby and craft stardom, it’s time to put together the absolute, must have, can’t-do-without-it piece of equipment every crafter needs: a worktable. Every artist needs a canvas, and the worktable, or easel, is yours. Make sure it’s made from a durable material that can stand the test of time and survive all the cuts and nicks you’ll subject it to. If you’re the type of person who needs to stand to unleash their creative beast, invest in a table with adjustable legs. That way, you can change your approach for each stage of the project. Pro Tip: Make sure your table has deep drawer space you need to store all your tools and supplies. The best worktable in the world is useless without any light! Make sure that your space has a lot of natural lighting so you can let your creativity shine. Don’t stop at natural light, though! Invest in some LED task lighting so you can really get into the cracks and crevices and make sure that every intricate detail is up to your standards. Not all lighting needs to be functional, though. Remember: this is YOUR space. Consider investing in a nice lamp to add a warm and inviting energy to your area perfect for getting the creative juices flowing. Or hang an elegant chandelier to make things a bit more fancy. Your imagination is the only limit! When you have an idea, it’s easy to run with it and forget about everything else, including organization. In no time at all, your immaculate craft and hobby space is suddenly a trash heap. Don’t fall into this trap by planning your storage needs before you break ground. With some simple storage solutions, you can spare yourself the headache of having a messy space that ruins your flow. The supplies you use the most should be easily accessible and within reach. What do you do about those finished pieces you’re ready to show off to the world, though? Grab yourself a, spacious bookshelf or cupboard to store your masterpieces until it finds a home. If you can’t find the perfect shelving solution, I recommend you hire a professional to make you custom storage to you exact specifications. It doesn’t stop at cupboards, bookshelves, and worktables though. Think about utilizing all that beautiful wall space you have with hooks, pin boards, and bulldog clips. Through some simple and creative use of your space, people will think a true maestro is at works. 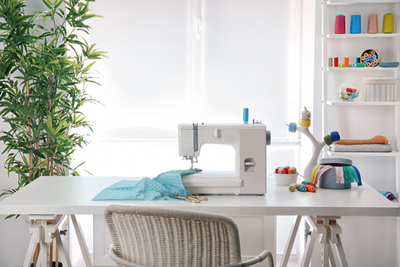 Your craft and hobby space is more than just a workspace. It’s an extension of you. It shows the world your creative tastes and invites people to take a look into your creative mind. Don’t be afraid to slap on a few layers of your favorite paint to add your sense of style to the room! A warm coat of paint not only creates an environment where ideas flow, but it invites others to truly appreciate the hard work you put into your work. Creating your craft and hobby space shouldn’t be a chore. Have some fun and really let this space show everyone your artsy side. With these small and practical tips, you’ll be well on your way to having a perfect craft and hobby space.